March 2015 - Contemporary Controls (Suzhou) will be attending the China Refrigeration (CRH) Expo from April 8-10, 2015 at the Shanghai New International Expo Centre, China. The CRH Expo is a large, international platform where the latest technologies, products and services in the HVAC&R industry are showcased. Over 40,000 people attended last year. 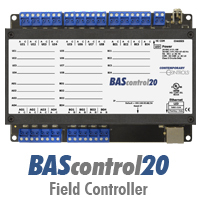 Make sure to stop by Contemporary Controls' Booth W5A13 to see our cost-effective, BAS products designed to accompany HVAC&R automation networks from our BASautomation® - Building on BACnet® product line. Our economical, standalone BASrouters provide routing between networks such as BACnet/IP, BACnet Ethernet and BACnet MS/TP. The BASrouterLX high performance router has a high-speed processor attached to a BACnet client via a 10/100 Mbps Ethernet network, and can support serial data rates up to 115.2 kbaud. The BAScontrol20 utilizes a powerful 32-bit ARM7 processor with 512 kB of flash memory plus a 16 Mbit serial flash file system for storing configuration data and an application program. 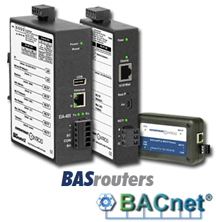 By operating at the BACnet/IP level, the BAScontrol20 can share the same Ethernet network with supervisory controllers and operator workstations. Provides 66 Sedona components from Tridium, and 100 custom components from Contemporary Controls. (These include 48 web components that can be viewed and manipulated by a web browser and 24 virtual points that can be read or written by a BACnet client). In addition to its 20-points, the BACnet/IP Sedona Field Controller incorporates Sedona Virtual Machine (SVM) technology. System integrators using the device can develop control applications with Workbench's powerful drag-and-drop visual programming methodology and tools such as Niagara Workbench or Sedona Workbench. Once developed, the program remains stored in the BAScontrol20 and executes by way of the SVM. The application can run standalone or interact with a program in a JACE supervisory controller over Ethernet. The amount of potential applications is unlimited. Models exist for both triac and relay binary outputs. 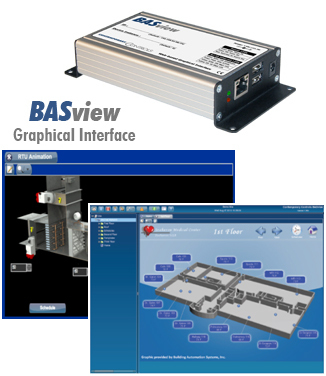 The BASview is a stand-alone, embedded, web-based graphical interface for building automation and process automation systems. It can be accessed from any web browser - providing client functionality to any BACnet/IP or Modbus TCP system and it requires no licensing. By using Contemporary Controls BASrouter or BASgateway products, additional protocols such as BACnet MS/TP and Modbus RTU and Modbus ASCII are supported. Client features include animated graphic screens, scheduling, historical trending, runtime accumulation and alarm monitoring. Automatically toggles outputs and changes setpoints on schedule, collects runtime and trend data, and monitors alarm conditions. As an embedded device, BASview uses Flash memory for internal storage instead of a hard disk to maintain its ruggedness. The BASview is totally self-contained, requiring no external PC or application for its use. Any number of web browser users can access the device. The only requirement is the installation of an Adobe Flash player in the browser. For those who need to integrate BACnet systems with Modbus devices such as those used for boiler control, variable speed drives, and metering applications, our cost-effective BASgatewayLX is designed to make gateway commissioning as simple as possible. With virtual routing, up to 30 Modbus devices appear as individual BACnet devices. Using web pages and a resident database of common Modbus device profiles, Modbus registers can be mapped to BACnet objects. Comprehensive library of Modbus device profiles reside within the BASgatewayLX that helps to remove the burden from the system integrator commissioning the system. Additional custom device profiles can be downloaded from our website. Visit our CRH page to see what we will be exhibiting and how our BASautomation products come together to provide economical network solutions.